Whose Steering Your Vehicle? It Should Be You! In order for you to maintain control of your vehicle all of your major operating systems must be working at peak performance—including your wheel alignment. If your steering feels off, then it’s time to stop by for an inspection. Is It Time For An Alignment Inspection? Your wheel alignment should be inspected with every 10,000 Mile Maintenance Service—or any time you feel a change in steering. While an inspection is needed every 10,000 miles you may not be in need of alignment. We have the advanced technology to return your alignment to factory standard, precision perfect alignment! It Hasn’t Been 10,000 Miles But My Steering Feels Off? It is important to keep in mind that your steering can be knocked out of alignment after hitting a curb, driving on rural roads, off-roading, driving over potholes, after a major collision, or after a minor fender-bender or one-car collision. So if you aren’t due for a Mile Maintenance Service but your alignment or anything else on your vehicle doesn’t sound, look, feel or smell right—stop by for an in-depth diagnostic check. Uneven wear on your inner or outer tire tread on one or more of your tires. If it has become more difficult to steer when turning either left or right. Your car pulls more in high or medium winds. Your steering wheel is no longer centered when driving straight. You have a drop in fuel efficiency. If any of these signs are present we urge you to stop by Checkpoint Automotive as soon as you can. 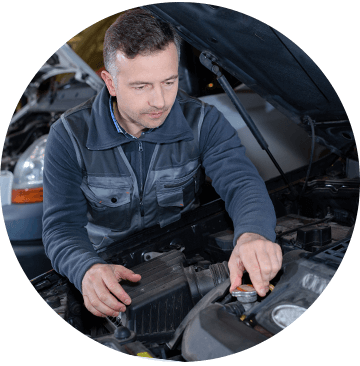 We will perform a full inspection to ensure your vehicle is still roadworthy and perform an alignment repair before further damage is done. Our technicians are ASE Certified, and all of our parts and work are backed by either 24 months/24,000 miles or 36 months/36,000 miles warranty! If your alignment has been off for a while your tires will wear faster than expected. Sometimes a tire rotation and rebalancing is all you need, but sometimes you may require one or more new tires. We provide the full range of tires services and sell a quality selection of both Continental and General Tires. This includes All-Season, Winter Weather, High Performance, Specialty Tires, and more! If your alignment, service or repairs doesn’t quite fit in your budget you are welcome to apply for repair financing. This will keep you safe and, on the road, while minimizing the strain on your budget.